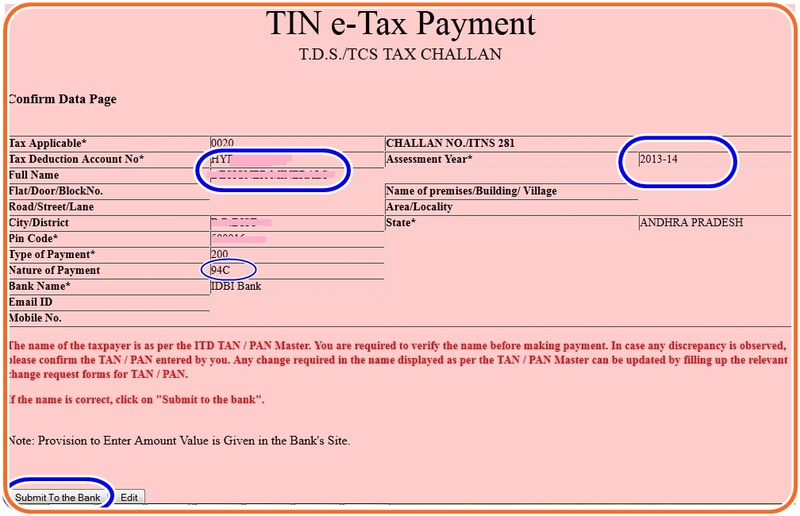 Home Income Tax TAN TCS TDS How to make TDS/TCS (CHALLAN 281) payment through Online ? The Indian Income tax dept allows you to make TDS/TCS payments through online. Internet payment is easy and safe method. Now a days companies pay TDS/TCS for every month through cheques. Cheque payment is long and late process. If you use TDS/TCS payment through online, you can save lot of time and complete the payment with out fail. No need to fill forms and chques. Chques, cash deposit is not required. so you can reduce your long process transactions and save your valuable time. Chequs payment takes more time than online payment. so there may be chances to penalty for late payments. So you can reduce penalty and Interests for online payment. You can make payment at any time (24X7). the NSDL website allows you to make payment at any time. But some banks fixed cutoff time. so check your company bank's website for this information. Click on "CHALLAN NO./ITNS 281"
> Enter your company 10 digit TAN number. > Enter you company city, PIN and select state. > Select type of Payment as "(200)TDS/TCS Payable by Taxpayer"
> Enter the characters you see in the picture above. Now you can see the following screen. Just verify your company name etc. If everything is correct then click on "submit to the bank" button. Enter the Basic Tax etc.. Enter Net-banking UN & PW and follow next steps as per banks requirements. After complete the e-payment, you will get CIN, it is required when you file your returns. Its very well drafted, Please update us How to rectify the TDS Challan while physically making the payments of TDS bank has written wrong TAN number in chalan. Thanks for sharing the great useful information. Really liked the informative post.